Knives seized by police in London, where stabbings are on the rise. 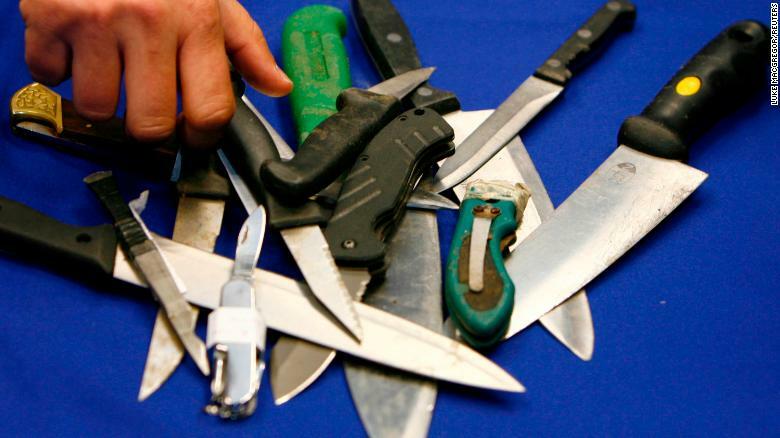 Children are most likely to become victims of stabbings as they walk home from school, a London study has found, as its authors warn of the “endemic” nature of knife crime among youths in the UK capital. The risk of stabbing for children younger than 16 jumps significantly in the immediate hours after schools close, with crimes usually occurring close to a victim’s home, according to research by doctors at Queen Mary University, published Tuesday in the journal BMJ Open. The findings underline the worsening epidemic of violent crime in the city, where homicides have risen for the third consecutive year and have prompted calls for a greater focus on preventative techniques to tackle knife crime. “There are children and young people exposed to violence literally on a daily basis, who are not members of gangs; they are just schoolkids,” said the study’s lead author, Dr. Karim Brohi, a consultant trauma surgeon at Barts Health NHS Trust. The figures demonstrate “an endemic problem around school-based violence,” he said. The researchers analyzed data on 1,824 people 25 or under who were treated for stab wounds at an east London trauma center between 2004 and 2014 and recovered incident times and locations from ambulance data and the hospital’s registry. They found that children under 16 were significantly more likely to be stabbed between 4 and 6 p.m. on a school day than young adults (between 20 and 24), with 22% of all child stabbings occurring between those times, compared with 11% in young adults. Almost half of those stabbings occurred within 5 kilometers of the victim’s home, they found. The majority of remaining stabbings occurred later in the evening, in line with other figures for young adults. An overall increase in children seen at trauma centers for “assault resulting in penetrating trauma” saw an average increase of 25% each per year between 2004 and 2014. The data also highlighted income inequalities in stabbing victims, with 71% of incidents occurring in poorer neighborhoods compared with just 1% in wealthier areas. The study is the latest to highlight the increase in violent deaths in London in recent years. A fatal stabbing on Monday evening put the city’s tally of homicides this year at 119, tying the highest annual number since 2010 when terror-related deaths are excluded, according to figures from the Metropolitan Police. Five fatal stabbings have been reported in London in the past week alone, according to the police. Across England and Wales, knife-related crime is at its highest level since 2011, with the year ending March 2018 having seen a 16% increase from the previous 12 months, the Office of National Statistics says. The problem has placed pressure on London Mayor Sadiq Khan, who told the BBC on Monday that it could take a decade until progress is made. The issue has also received international attention, in part due to US President Donald Trump’s comment in May that an unnamed London hospital was like a “war zone,” with “blood all over the floors” due to knife crime. Trump did not provide detail or evidence for his assertion. The doctors behind the study said the findings highlight a need for a change in attitude and approach to youth knife crime. Green echoed calls for a preventative approach, saying, “You can’t just keep arresting people and the problem goes away. You have to concentrate on dealing with the causes.